He did not forsee that one effort would not be enough, or even eight. Nor did he know that in the end, the Muslems would keep Palestine or that nine centuries later, Muslim extremists would still be using this speech as a pretext for attacks on nations that did not yet exist and on continents then unknown. The below extract is from Robert the Monk's version of it, written 25 years later. But if you are hindered by love of children, parents and wives, remember what the Lord says in the Gospel, "He that loveth father or mother more than me, is not worthy of me." "Every one that hath forsaken houses, or brethren, or sisters, or father, or mother, or wife, or children, or lands for my name's sake shall receive an hundredfold and shall inherit everlasting life." Let none of your possessions detain you, no solicitude for your family affairs, since this land which you inhabit, shut in on all sides by the seas and surrounded by the mountain peaks, is too narrow for your large population; nor does it abound in wealth; and it furnishes scarcely food enough for its cultivators. Hence it is that you murder one another, that you wage war, and that frequently you perish by mutual wounds. Let therefore hatred depart from among you, let your quarrels end, let wars cease, and let all dissensions and controversies slumber. Enter upon the road to the Holy Sepulchre; wrest that land from the wicked race, and subject it to yourselves. That land which as the Scripture says "floweth with milk and honey," was given by God into the possession of the children of Israel Jerusalem is the navel of the world; the land is fruitful above others, like another paradise of delights. This the Redeemer of the human race has made illustrious by His advent, has beautified by residence, has consecrated by suffering, has redeemed by death, has glorified by burial. This royal city, therefore, situated at the centre of the world, is now held captive by His enemies, and is in subjection to those who do not know God, to the worship of the heathens. She seeks therefore and desires to be liberated, and does not cease to implore you to come to her aid. From you especially she asks succor, because, as we have already said, God has conferred upon you above all nations great glory in arms. Accordingly undertake this journey for the remission of your sins, with the assurance of the imperishable glory of the kingdom of heaven. Most beloved brethren, today is manifest in you what the Lord says in the Gospel, "Where two or three are gathered together in my name there am I in the midst of them." Unless the Lord God had been present in your spirits, all of you would not have uttered the same cry. For, although the cry issued from numerous mouths, yet the origin of the cry was one. Therefore I say to you that God, who implanted this in your breasts, has drawn it forth from you. Let this then be your war-cry in combats, because this word is given to you by God. When an armed attack is made upon the enemy, let this one cry be raised by all the soldiers of God: It is the will of God! It is the will of God! Right or wrong, I still think that 900 years is a long time to carry a grudge. Moreover, the USA did not yet even exist, so why blame us? Pictured: Urban preaches the Crusade to the assembled clergy at Clermont. 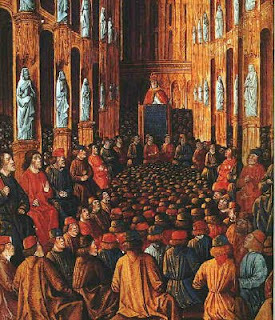 More information: Council of Clermont, The Speech.